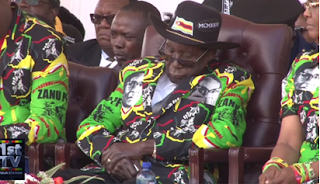 Former Higher and Tertiary Education minister Jonathan Moyo has revealed that he was saved by former president Robert Mugabe and his wife Grace as the army bayed for his blood. Taking to his favourite Twitter account, Moyo posted pictures of his Borrowdale mansion whose floors were blood-stained. He wrote: “Special thanks to president Mugabe and Amai Dr Mugabe for saving us when the Junta tried to kill us on 15 Nov”. Chombo is currently out on bail, facing charges of criminal abuse of office. In his latest post, Moyo bade his Twitter followers goodbye, claiming a major project that he is working on will keep him away from the micro blogging site. Kwaheri is a Swahili word which means “go well”. The word was popularised in Zimbabwe by one Nathaniel Manheru, a shadowy columnist who used to write in one of the State-owned dailies.